Right now, there are lots of treasure houses glowing all over the Chicago area. Some are adorned with safe, tasteful little white lights. Some have a menorah shining in the window. 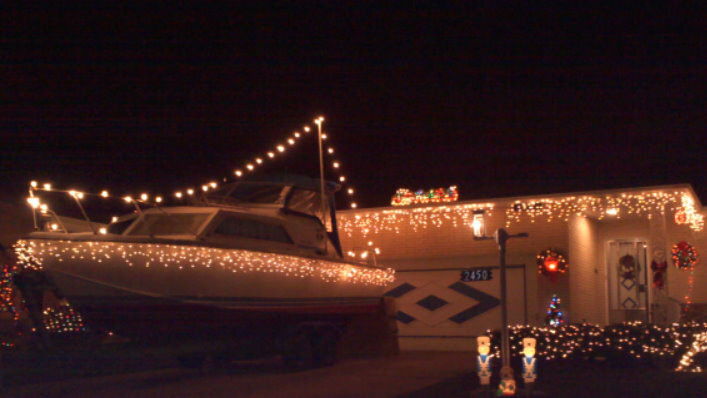 Others are decorated with so many lights, they can probably be seen from Jupiter. Here, the owner has not only decorated his home, but also his treasure, his boat. In this west-suburban community, homeowners go all out during the season. They decorate anything that does not move. Every form of yard art, from tin soldiers, snowmen, Santas, snow globes and dinosaurs (now there’s a Christmas symbol for you) is on display from Thanksgiving through January. The decorating has become a bit more subtle in recent years, whether that’s due to a change in homeowners, or the bad economy. However, it is still quite evident that people who live there take a lot of joy in making the season bright. Life is full of treasures, and I hope that you, dear readers (both of you), enjoy light, happiness and peace in this season.